Two American astronauts and a Russian cosmonaut living on theInternational Space Station will have to return to Earth a few days early to avoidinterfering with an international security summit being held near their landingsite in Central Asia. NASA astronauts Shannon Walker and Douglas Wheelock andRussian cosmonaut Fyodor Yurchikhin are now slated to land their Russian SoyuzTMA-19 space capsule on the central steppes of Kazakhstan on Thursday, Nov. 25at 11:46 p.m. EST (0446 GMT on Nov. 26). The crew is wrapping up a five-monthflight to the InternationalSpace Station. The Soyuzlanding was originally scheduled to occur four days later, on Nov. 30, butKazakh officials wanted to restrict air traffic a few days before the start ofthe Organization for Security and Cooperation in Europe summit, which is beingheld in Astana, Kazakhstan, Dec. 1-2. Astana is approximately 250 miles (400 kilometers) away fromthe Soyuz landing site. "Kazakh officials asked our Russian partners if theycould make the adjustment to avoid conflicts with the conference," NASAspokesman Kelly Humphries told SPACE.com from the Johnson Space Center inHouston. "There's some preparation work that's going to have to be changeda little bit, and some maintenance work that requires additional crewmemberswill be shifted." The adjustments are not expected to cause any problems, andwith the opening of the next space shuttle launch window quickly approaching,the change might even free up some traffic in space. "There was already work in the mill regarding a Nov.30th launch of the shuttle to begin that mission," Humphries said. "So, maybe it's going to work out nicely for the crew with this time frameshifted over a little bit." NASA is preparing space shuttle Discovery is slated to flyon its final voyage on Nov. 30. That launch target, however, depends on thecompletions of repairs being made to Discovery's external fuel tank. The launchwindow for Discovery opens on Nov. 30 and closes on Dec. 6. 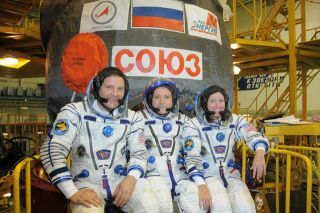 In the meantime, Yurchikhin, Walker and Wheelock willcontinue making preparations for their homecoming as they near the end of theirlong-duration stay aboardthe space station.The three spaceflyers launched to the station on aRussian Soyuz rocket on June 15. After their departure, the station will drop down to athree-person crew ?until mid-December, when Catherine Coleman, Paolo Nespoliand Dmitri Kondratyev journey to the space station to round out the outpost's Expedition26 crew.